Blue Line Art offers a All-New Series of Comic Book Art Supplies starting with the Ultimate Art Set line. 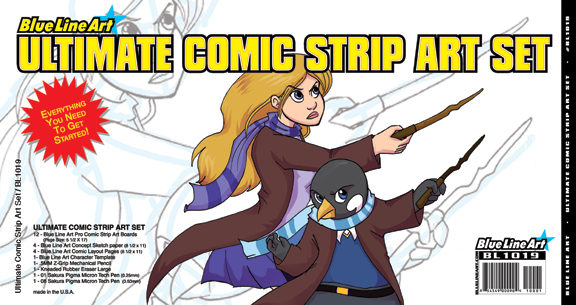 Ultimate Comic Strip Art Set offers the artist all of the Blue Line Art exclusively created boards and papers needed to start creating their own stories plus the actually tools to illustrate. Each of the Ultimate sets includes everything you need to start drawing immediately. Ultimate Comic Book Art Set offers the Comic Artist an exclusive package of Blue Line Art Boards, Papers and tools to create a comic book. 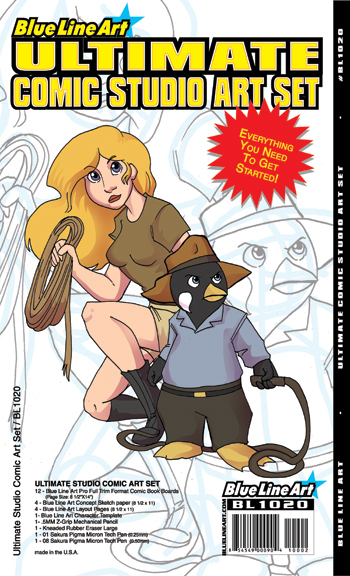 Each of the Ultimate sets includes everything you need to start drawing immediately! 12 – TRAD. 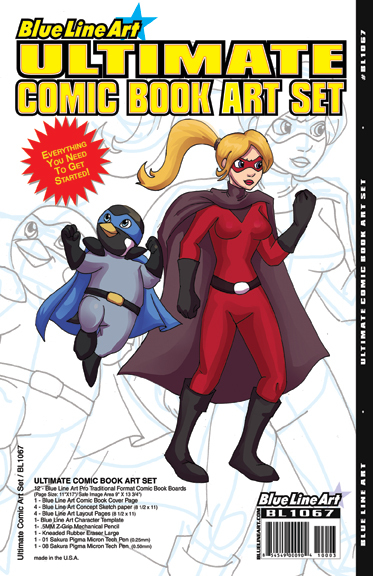 PRO COMIC BOOK ART BOARDS 11″x17″, 1 – COMIC BOOK COVER PAGE 11″ x 17″, 4 – CONCEPT SKETCH PAPER 8 1/2″ x 11″, 4 – COMIC STRIP LAYOUT PAGES 8 1/2″ x 11″, 1 – Character Template 8 1/2″ x 11″, 1 – 0.5mm lead pencil, 1 – Kneaded Eraser, 1 – Sakura Pigma Micron 01, 1 – Sakura Pigma Micron 08, A instructional sheet on how to use these products to bring out your ideas. Package: size: 11″ x 17″, container: Clear Polypropylene Art Bag. 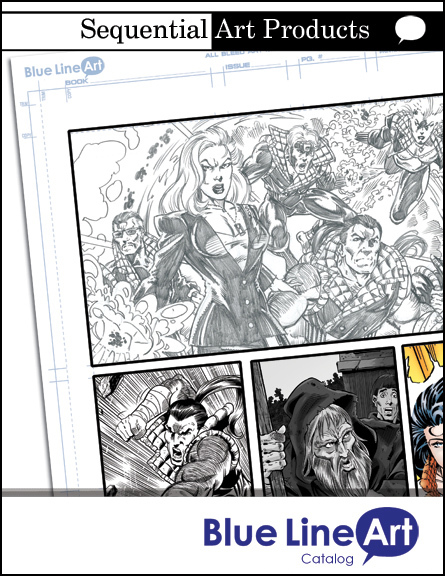 Ultimate Comic Studio Art Set offers the Comic Artist an exclusive package of Blue Line Art Boards, Papers and more art tools to create a comic book. 12 – PRO COMIC BOOK BOARDS 8 1/2″ x 14″, 4 – CONCEPT SKETCH PAPER 8 1/2″ x 11″, 4 – COMIC BOOK LAYOUT PAGES 8 1/2″ x 11″, 1 – Character Template 8 1/2″ x 11″, 1 – 0.5mm lead pencil, 1 – Kneaded Eraser, 1 – Sakura Pigma Micron 01, 1 – Sakura Pigma Micron 08, A instructional sheet on how to use these products to bring out your ideas. Package: size: 8 1/2″ x 14″, container: Clear Polypropylene Art Bag. Ultimate Comic Strip Art Set is designed for Comic Strip Artist print or web by including a variety of Blue Line Comic Strip Boards, Papers and Art Tools. 12 – COMIC STRIP ART BOARDS PRO 5 1/2″ x 17″, 4 – CONCEPT SKETCH PAPER 8 1/2″ x 11″, 4 – COMIC STRIP LAYOUT PAGES 8 1/2″ x 11″, 1 – Character Template 8 1/2″ x 11″, 1 – 0.5mm lead pencil, 1 – Kneaded Eraser, 1 – Sakura Pigma Micron 01, 1 – Sakura Pigma Micron 08, A instructional sheet on how to use these products to bring out your ideas.